1. You should use a Perforated Radiant Barrier material (ARMA FOIL™) for this application. 2. 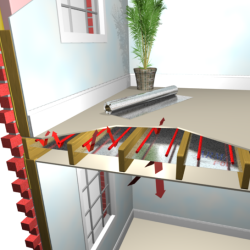 From the crawl space, unroll the Radiant Barrier and staple to the bottom of the floor joists, overlapping each run of radiant barrier by about 2 inches. Staples should be spaced around 12 to 18 inches apart. 3. 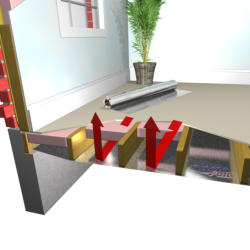 You can use our Foil Tape to tape the seams and cut down on air infiltration. 4. 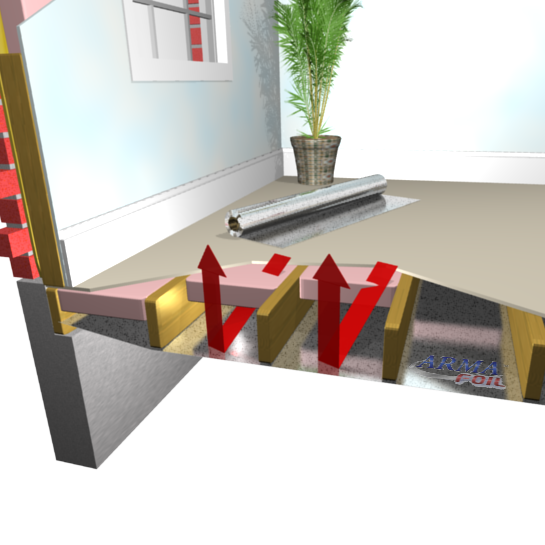 Depending on your floor configuration you may find different material widths easier to work with. ARMA FOIL™ is available in the following widths: 48", 26", 24", 18", 16"
1. You should use a perforated material (ARMA FOIL™) for this application. 3. Install the material under radiant heat tubing with a minimum 1 inch clearance. 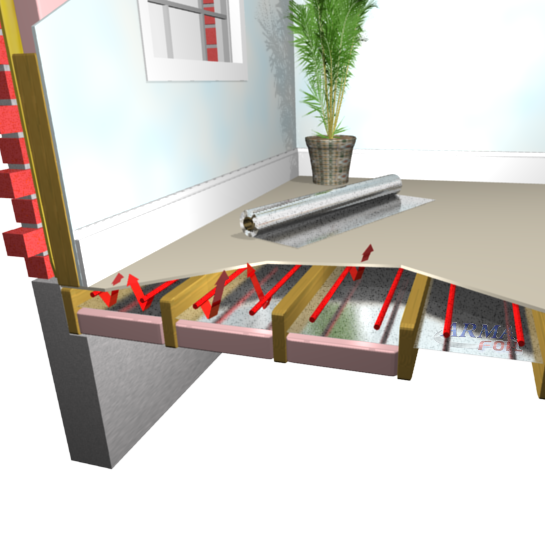 Staple to the sides of the floor joists or allow the material to rest on top of the floor insulation. 4. Install your conventional (fiberglass) insulation to the underside of the Radiant Barrier. Notes: Widths for dimentional lumber - 26" for use with 24" o.c. or 18" for use with 16" o.c. Widths for manufactured floor joists - 24" for use with 24" o.c. or 16" for use with 16" o.c. 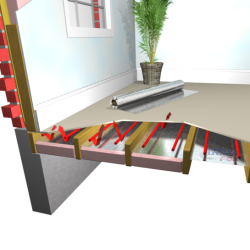 When used in the floor between heated floors, the Radiant Barrier helps direct the heat to the zone in which it was intended. 3. Install the material under radiant heat tubing with a minimum 1 inch clearance. Staple to the sides of the floor joists. Notes: Typically, conventional insulation is not used here, except for sound control. Widths for dimentional lumber - 26" for use with 24" o.c. or 18" for use with 16" o.c.